Even when play doesn’t allow for synthetic grass, UltraBaseSystems panels easily transform high-traffic pedestrian areas into maintenance-free zones. 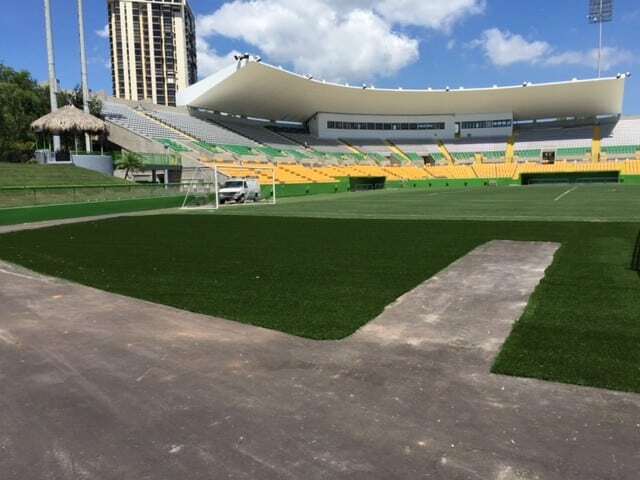 This recent installation by our friends at TLI Sports in Clearwater, Florida addresses the problems associated with high traffic on natural grass as compared to the durability of a UBS synthetic turf system. Thousands of Tampa Bay Rowdies fans can now enjoy a beautiful, clean and dry walkway and concession area allowing the stadium crew to spend their time on the field, not on the common areas. Thanks to Greg Meeks and TLI Sports for making UltraBaseSystems look so good. As in many cases, an UltraBaseSystems installation is as easy as sod cut the existing terrain, grade and compact, install the geo fabric and UBS panels and roll out the turf. In this installation it was that simple.